ASUS is ready to release a giant in smartphone industry with 6GB RAM and 256 GB internal memory again expandable with card slot of 128GB and adding to it 6000mAh battery. ASUS Z2 Poseidon price in India and World wide not revealed yet. They were the first to introduce a 4GB RAM handset in the world, so we really look forward to see what they will do with a 6GB RAM one. 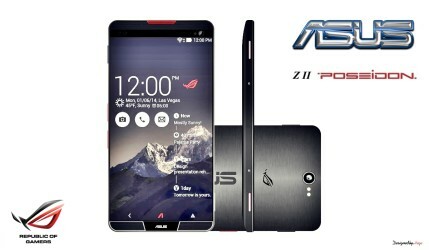 If it is this ASUS Z2 Poseidon or the ASUS Z1 Titan specifications and review below, you we’ll become crazy on it. In terms of ASUS Z2 Poseidon specs, its is said to sport a 6.0-inch Quad HD display, a new Intel chip (said to be a 2017 version), a 16MP rear + 5MP front camera set, up to 6GB RAM, and 256GB of internal memory. Besides, Android N OS and a massive 6,000mAh battery are also mentioned as what stay under the hood to run the whole machine. Product Viral: ASUS Z2 Poseidon 6GB RAM, 256 GB Internal, 6000 mAh Battery and More ....!! !